To sum it all up - the best damn bar in Denver, Colorado is The Cruise Room in the Oxford Hotel. With its glowing red up-lit walls that make us weak in the knees, and it's extensive list of signature cocktails, it is impossible to go wrong. 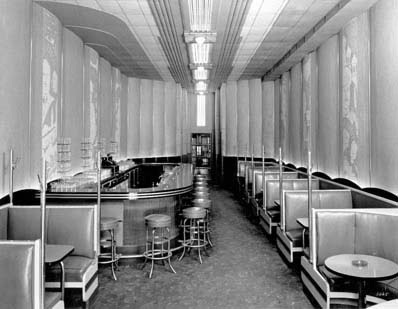 The bar opened the day after Prohibition was repealed in 1933, a worthy cause for celebration if you as us, and was modeled after a bar on the Queen Mary. 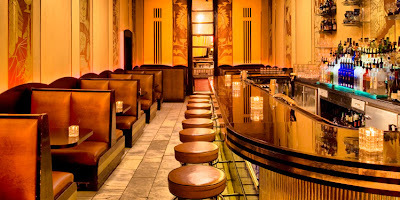 The interior is original - the leather banquets, the vertical orange murals on scalloped walls, and the most exquisite glossy black bar that makes us want to lie down on it and have someone feed us maraschino cherries. It is Art-Deco heaven. And then they went and added that pink and red neon over the door - ecstasy. They brag about their vodka martinis, but we much prefer the Gin and Juice served with fresh squeezed grapefruit juice. 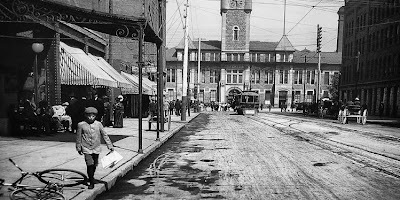 A side note about the Oxford Hotel: it was the first hotel in Denver, and was built in 1890 by local architect Frank E. Edbrooke, who also designed the Brown Palace Hotel. "The classical simplicity of The Oxford's exterior belied an extravagant interior, as opening day guests discovered on October 3, 1891. This luxury downtown Denver hotel, according to the Rocky Mountain News, sported the latest in gadgets and technology as well as Gilded Age opulence. The hotel had its own power plant and the most perfect system of steam heating, electric and gas lighting, and on each floor bathrooms had separate water closets with the latest improved sanitary appliances. The kitchen, added the News, is located so that none of the odor can possibly permeate through the house, and is provided with a series of ranges, broilers and all the utensils known to the culinary art. Dining tables glistened with cut, engraved glassware and Haviland China and silverware inscribed "Oxford." In a separate dining room for gentlemen only, merchants and bankers, politicos and attorneys, could feast privately before getting down to cigars and business. Antique oak furniture, marble and carpet floors, frescoed walls, silver chandeliers and stained glass glistened inside. Every room had an abundance of light and air because Edbrooke wrapped the hotel around a light well. With its own dining rooms, barber shop, a library, a pharmacy, a Western Union office, stables and a splendid saloon serving Zang's "Fritz Imperial," The Oxford was and still is an authentic Denver hotel, a city within a city."